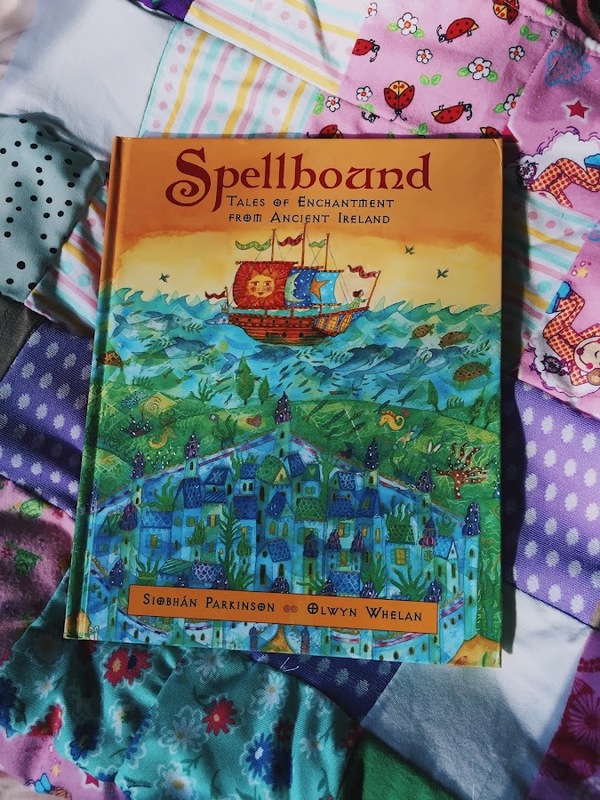 A bit of color and beauty in the form of Irish fairy tales for you today - 'Spellbound: Tales of Enchantment from Ancient Ireland' by Siobhan Parkinson and Olwen Whelan is a beautiful library find that really knocked me out. 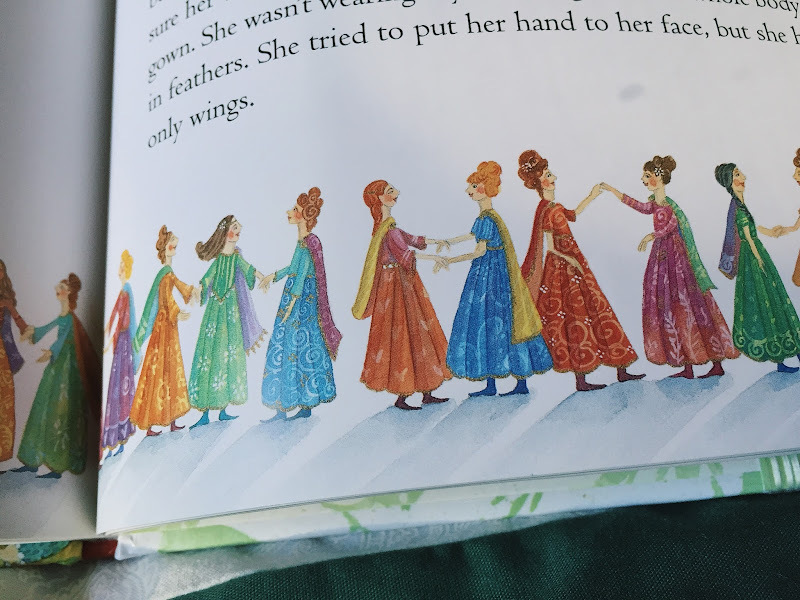 Julia read it in one sitting and we did a great deal of oooohing and aaaahing over the art. It takes a lot to knock me back a pace and really lose it over some art in a book these days, but this one totally did. All this color you see on the pages? This was not enhanced by me in any way, by the by. It's really this vibrant! The tales include the classic 'Children of Lir' (for those of you up on your Irish foklore.....anyone?? 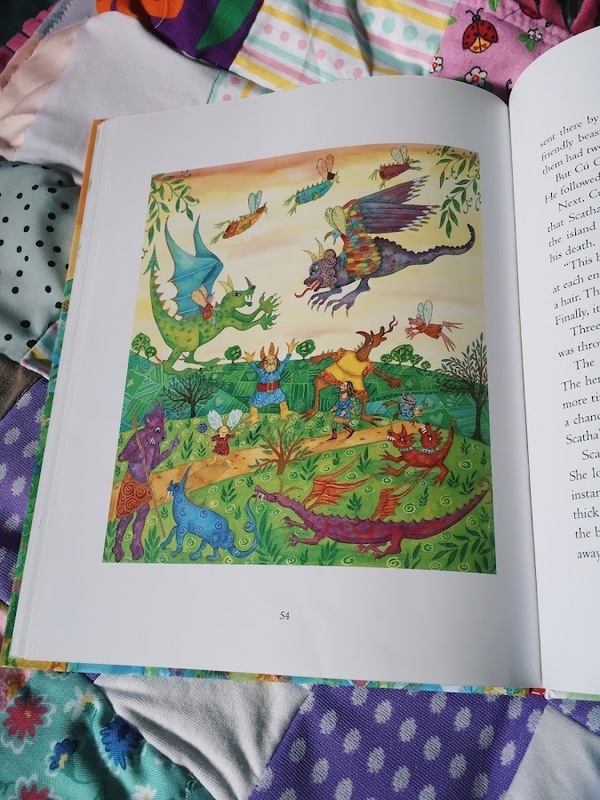 ), 'The Butterfly Girl', 'The Enchanted Deer', 'The Land Under the Waves', 'Oisin in Tir na nOg', 'Cu Chulainn and Emer' (about a famous Irish giant), 'The Enchanted Birds' (lot of enchantment going on) and 'Labhra with The Horse's Ears'. 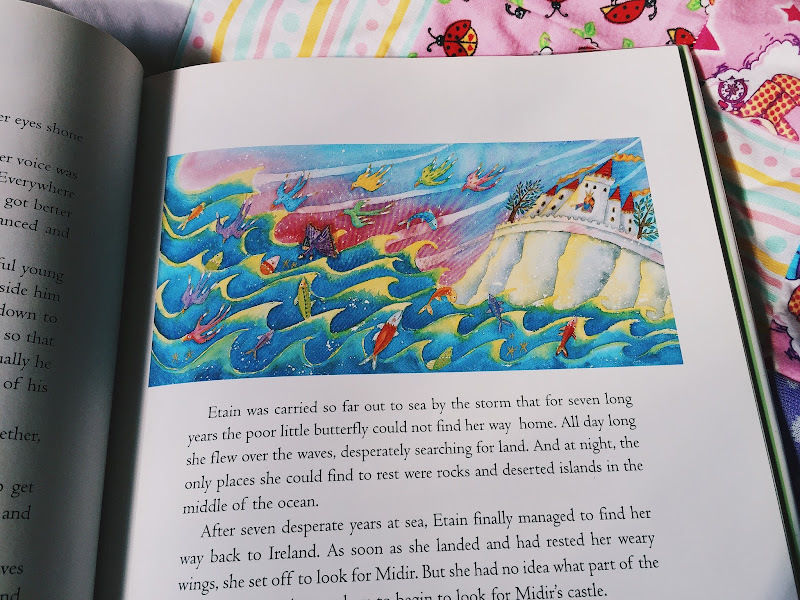 A word about 'Children of Lir' - a bit sad, the main characters all die at the end - it really annoys Julia, but she's not quite the seasoned fairy tale PROFESSIONAL that I am - I've never minded the sadder versions of fairy tales. But the rest of the stories are standard fairy tale fare. 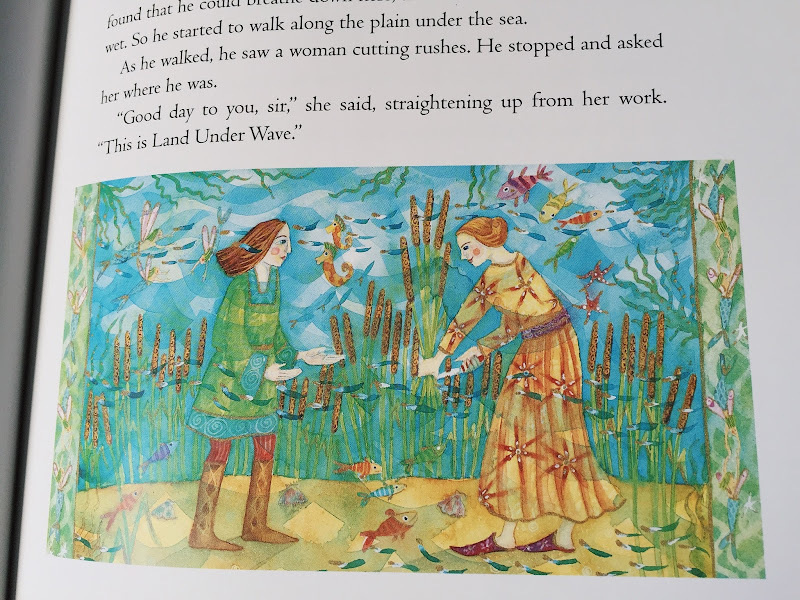 'The Land Under the Waves' is a bit like an Irish version of the Japanese story, 'Urashima Taro', if you're familiar with that story of a traveler who visits a magical palace deep in the ocean and falls in love with the princess who lives there, only to lose her when he feels like he MUST return home for a visit. 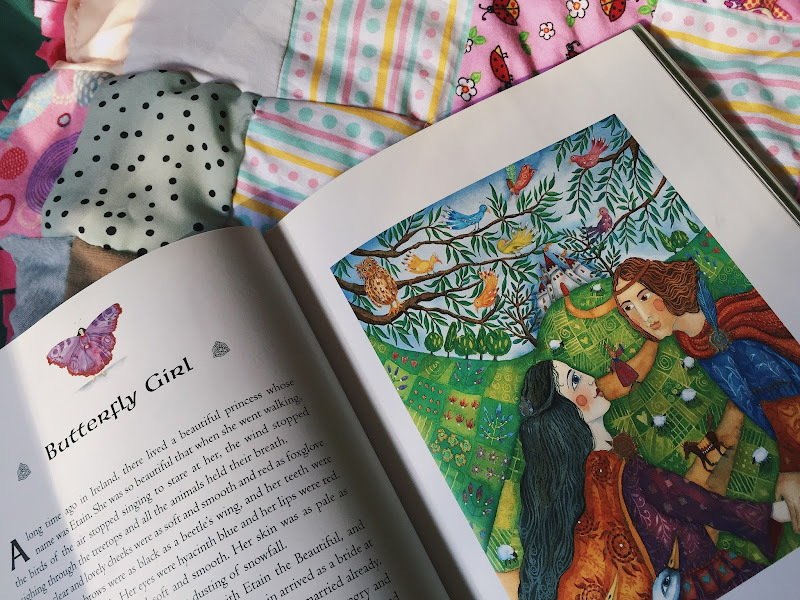 If you're into fairy tales, you should definitely check this out, and it's so pretty that it's Gift Worthy, which is always a big plus in my book. I'd say this is best for ages 6-9. 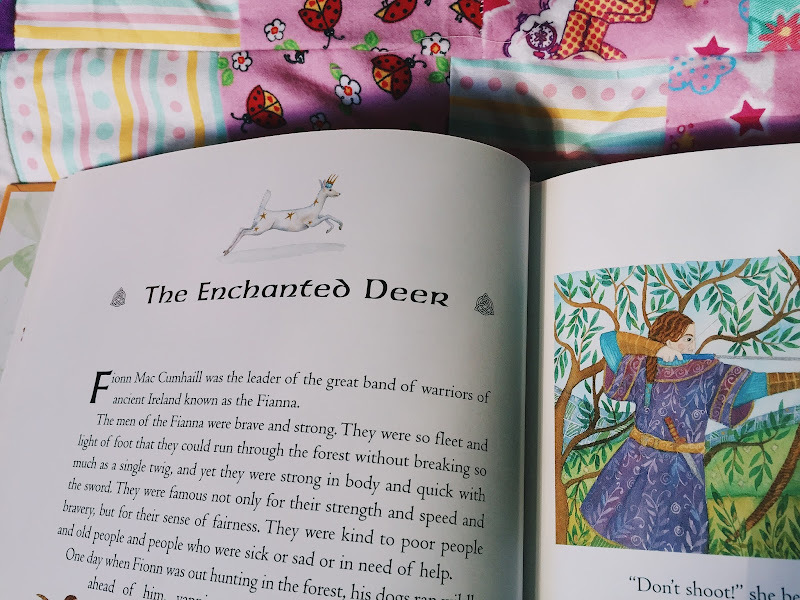 TELL ME if you've seen a particularly gorgeous fairy tale book that I should know about. I feel like I've become jaded in what impresses me these days in fairy tale land. I want to see things that make gasp and preferably squeak. Like a tiny mouse. My daughter is so embarrassed to go with me into bookstores these days....(or anywhere for that matter, ha ha ha). Thank you sweet Cherie!! This one is really a winner! My reaction to the first picture went something like this: GASP - "Ooooooh." It's just gorgeous. Hopefully I can get my hands on a copy through our library. Ooooh I hope so too - that's where I found mine! "The Children of Lir" is my favorite Irish tale. I first read it in an Irish Literature class in college. Irish Lit would have been a super fun class to take! You know what I took? 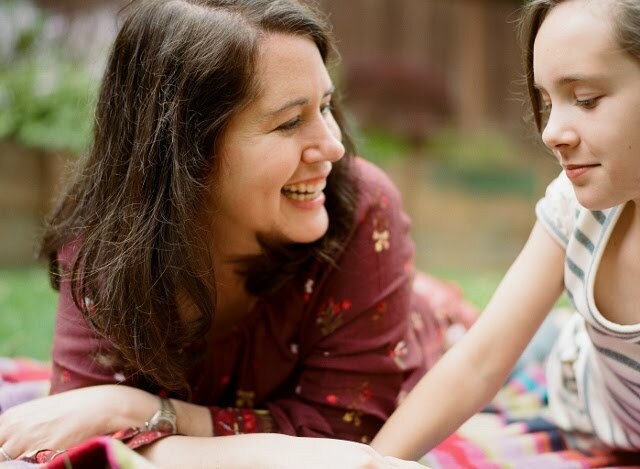 Children's Lit. LOL. *PS Check your spam filter. I think a few of my comments on other posts may have gotten netted.